Spring is the perfect time of year to come out of your winter hibernation and work on getting your summer body ready! 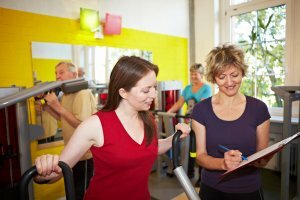 Whether you just want to lose a few holiday pounds to fit into that teeny bikini, or you have a long journey ahead of you to a healthier and fitter self, there are great exercises to help you kick start these resolutions. Here are the top 5 exercises to get that summer body you’ve been dreaming about! Summer days are on their way, it is the perfect opportunity to get outside and enjoy riding your bike while the weather is in that sweet spot between too cold and too hot. You can also enjoy plenty of scenic routes depending on where you live. Try either investing in or renting a mountain bike, and take a scenic ride through the trails. If you live in the city, you’ll find that many areas will rent bicycles to you to explore popular shopping strips, or beach trails. The best thing about this type of workout is that it is easily done at your own pace, and you’ll still see plenty of benefits. 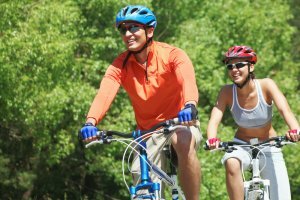 If you are moving a little more slowly out of the gate and need to find an exercise plan that doesn’t feel too intense, a leisurely afternoon bike ride can provide results without bringing you too much initial pain. It’s also a great way to ease back into exercise after a less-than-active winter season. Aquabiking is by far, one of the best ways to get back in shape at any stage in your fitness journey. Aquabiking, using tools like the Wike-Up Aquabike, offers a full-body workout with low intensity and high resistance. This makes it perfect for people starting a new workout plan. If you are already quite fit, you can opt to try a Wike-Up Performance series aquabike which is a more challenging piece of equipment for dedicated athletes. This type of exercise can be done individually in your own pool at home, or you may be lucky enough to have a studio in your area that offers classes. Aquabiking is also excellent for individuals coming off of rehabbing an injury. Of course, always check with your doctor before starting any new workout routine. Be sure to take advantage of using the aquabike’s handlebars to do arm exercises, as well as the back of the bike to stretch after a good workout. The aquabike is very multi-functional! Circuit training is easy to jump into at any gym. Most gyms will have a couple of set-ups to complete a full-body workout and allow you to tone and sculpt areas of your body that may go untouched with other types of exercises. This type of workout is also excellent if you are short on time. Most circuits can be completed in 30 minutes or less, so you can squeeze it in with no excuses. Now that the evil cold weather has started to dissipate, you can enjoy the local pool more often. 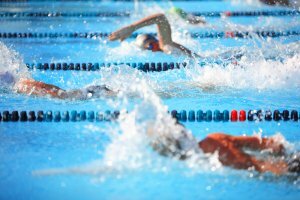 Swimming can be done at so many different levels of fitness, from a low-stress, leisurely breaststroke to an intense freestyle, there are plenty of ways to enjoy swimming laps and get your body ready for summer activities. A great thing to do in the pool to keep yourself both fit and entertained is to switch up the type of stroke you do. Try 5 laps freestyle, 5 laps breaststroke, 5 laps side stroke, and 5 laps backstroke to get in a quick 20 laps, and keep things interesting. If you have the time and want to amp up the intensity, repeat the routine, and make sure that you try to beat your own time the second time around. For those of you that live in an environment that jumps from Winter to Summer in an instant, you may be experiencing weather that is either too warm or too cold to complete some of the above workouts. Yoga can easily be done indoors either in the comfort of your own living room with the simple guidance of a good YouTube video, or in a local Yoga studio or gym that offers classes. Make no mistake, Yoga is not an easy exercise, but it can be incredibly beneficial and relaxing. With a beginner’s yoga class, you can easily start out any new exercise journey with this type of workout. So, are you ready to enjoy a rockin’ bod this summer? These 5 exercises will have you on your way to a healthy & fit life. Did we miss your favorite exercise for summer fitness? Let us know in the comments!